Credit growth of scheduled commercial banks (SCBs) picked up during 2017-18 amidst sluggish deposit growth. The stress in the banking sector continues as gross non-performing advances (GNPA) ratio rises further. Profitability of SCBs declined partly reflecting increased provisioning. This has added pressure on SCBs’ regulatory capital ratios. Macro-stress tests indicate that under the baseline scenario, SCBs’ GNPA ratio may rise from 11.6 per cent in March 2018 to 12.2 per cent by March 2019. The system level capital to risk-weighted assets ratio (CRAR) may come down from 13.5 per cent to 12.8 per cent during the period. Sensitivity analysis indicates that a severe shock to the GNPA ratio could bring down the CRAR of as many as 20 banks, mostly public sector banks (PSBs), below 9 per cent. 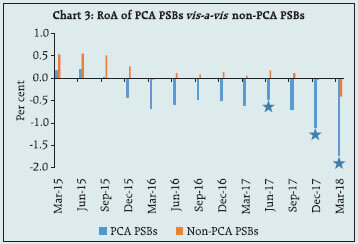 Macro-stress tests on public sector banks under prompt corrective action framework (PCA PSBs) suggest worsening of their GNPA ratio from 21.0 per cent in March 2018 to 22.3 per cent by March 2019 with 6 PCA PSBs likely experiencing capital shortfall under the baseline scenario. The PCA framework could help to mitigate financial stability risks by arresting the deterioration in the banking sector, so that further capital erosion is restricted and banks are strengthened to resume their normal operations. 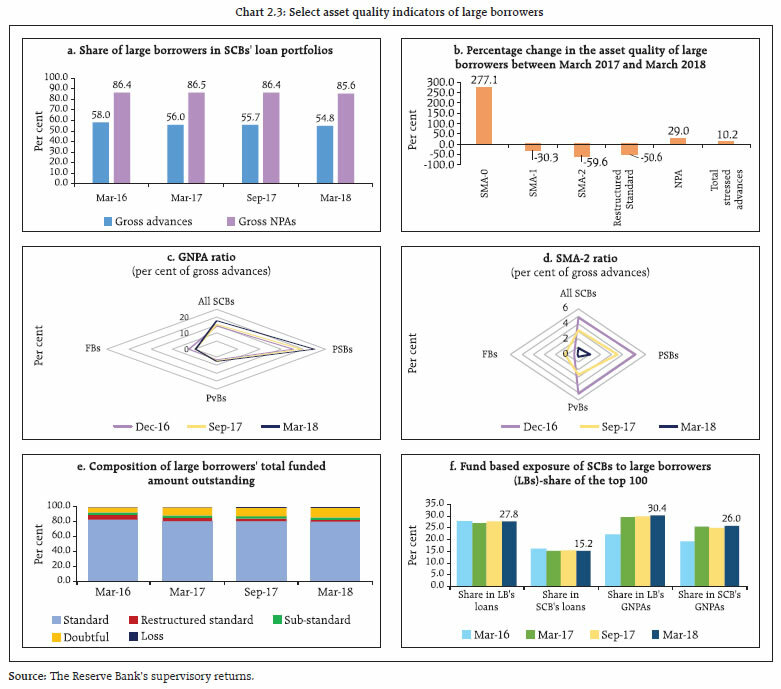 Analysis of inter-bank network reveals a reduction in the size of the interbank market coupled with a marginally higher level of interconnectedness in March 2018 as compared with the previous year. 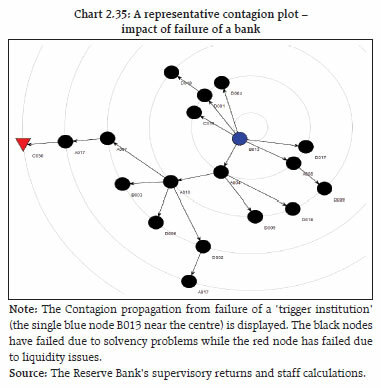 Contagion analysis of the banking network indicates that if the bank with the maximum capacity to cause contagion losses fails, it will cause a solvency loss of about 9.0 per cent of the Tier-I capital of the banking system. 2.1 In this section, the soundness and resilience of scheduled commercial banks (SCBs) is discussed under two broad sub-heads: i) performance, and ii) resilience using macro-stress tests through scenarios and single-factor sensitivity analyses2. 2.2 SCBs’ credit growth picked up on a year-on-year (y-o-y) basis across bank groups between September 2017 and March 2018. However, deposit growth decelerated for PSBs impacting the deposit growth of all SCBs. Their capital to risk-weighted assets ratio (CRAR) as well as the Tier-I leverage ratio3 declined marginally between September 2017 and March 2018 (Chart 2.1). 2.3 SCBs’ profit after tax plummeted mainly due to higher risk provisions between September 2017 and March 2018 (Chart 2.1). The share of net interest income (NII) in total operating income increased from 63.7 per cent in 2016-17 to 65.2 per cent in 2017-18, whereas, their other operating income (OOI) declined. 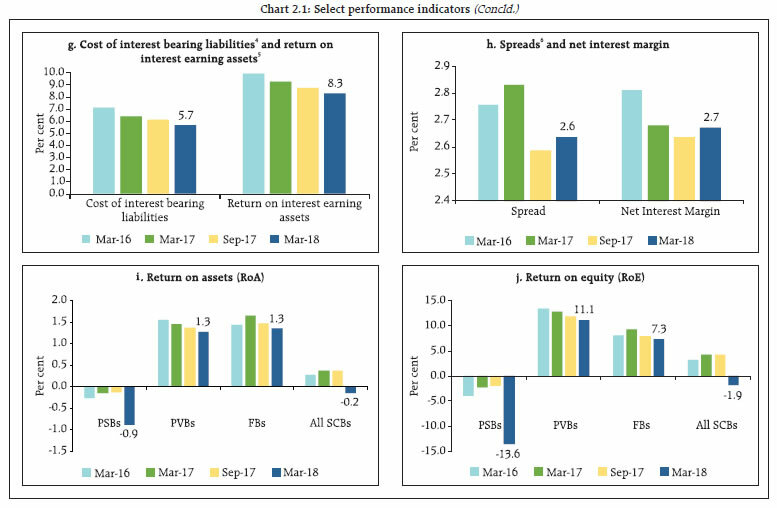 Among the components of other operating income, share of profit/loss due to securities trading showed significant decline in 2017-18 over 2016-17. Cost of interest bearing liabilities as well as return of interest earning assets for SCBs declined in 2017-18 as compared with 2016-17. Profitability ratios of SCBs turned negative mainly due to PSBs. 2.4 SCBs’ gross non-performing advances (GNPA) ratio rose from 10.2 per cent in September 2017 to 11.6 per cent in March 2018. However, their net non-performing advances (NNPA) ratio registered only a smaller increase during the period due to increase in provisioning. The GNPA ratio in the industry sector rose from 19.4 per cent to 22.8 per cent during the same period whereas stressed advances ratio7 increased from 23.9 per cent to 24.8 per cent. Within industry, the stressed advances ratio of sub-sectors such as ‘gems and jewellery’, ‘infrastructure’, ‘paper and paper products’, ‘cement and cement products’ and ‘engineering’ registered increase in March 2018 from their levels in September 2017. The asset quality of ‘food processing’, and ‘textiles’ sub-sectors improved during the same period. The provision coverage ratio increased across all bank groups in March 2018 from its level in September 2017. Among the bank groups, FBs had the highest provision coverage ratio (88.7 per cent) followed by PvBs (51.0 per cent) and PSBs (47.1 per cent) (Chart 2.2). 2.5 Share of large borrowers in SCBs’ total loan portfolios as well as their share in GNPAs declined marginally between September 2017 and March 2018. In March 2018, large borrowers accounted for 54.8 per cent of gross advances and 85.6 per cent of GNPAs. The category 2 of special mention accounts10 (SMA-2) as percentage of gross advances decreased across bank-groups. Top 100 large borrowers accounted for 15.2 per cent of gross advances and 26 per cent of GNPAs of SCBs (Chart 2.3). 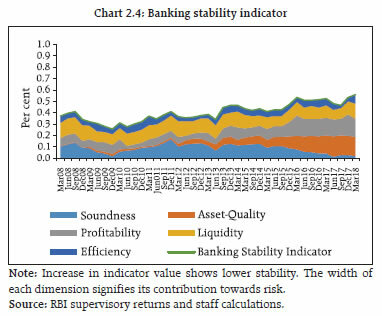 2.6 The banking stability indicator (BSI)11 showed that deteriorating profitability as well as asset quality pose elevated risks to the banking sector stability (Charts 2.4 and 2.5). 2.7 Weak profitability of SCBs is a concern as low profits can prevent banks from building cushions against unexpected losses and make them vulnerable to adverse shocks. Median return on assets (RoA) of SCBs came down further in March 2018 (Chart 2.6). There are several structural issues resulting in low profitability of SCBs, viz., high loan loss provisions, debt overhang, increasing costs and declining revenues. 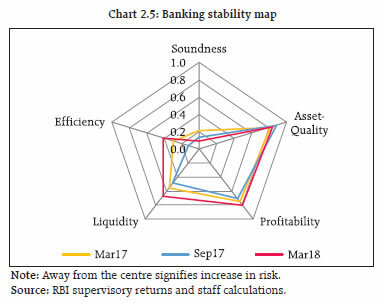 2.8 Profitability of weak banks (14 banks with RoAs in the bottom quartile) on an average has been worsening since September 2016 and more efforts will be needed to improve their resilience (Chart 2.7). Though such weak banks had higher pre-provisions operating profits (EBPT), the higher risk-provisioning against NPAs on their balance sheets resulted in their low profitability. 2.9 The resilience of the Indian banking system against macroeconomic shocks was tested through macro-stress tests for credit risk. These stress tests assess the resilience of the banking system to adverse but plausible macroeconomic shocks (please see Box 2.1 for details). These tests encompassed a baseline and two (medium and severe) adverse macroeconomic risk scenarios (Chart 2.8). The baseline scenario assumes the continuation of the current economic situation in future14. The adverse scenarios were derived based on standard deviations in the historical values of each of the macroeconomic variables separately, that is, univariate shocks: up to one standard deviation (SD) of the respective variables for medium risk and 1.25 to 2 SD15 for severe risk (10 years historical data). The horizon of the stress tests is one year. Bank Stress tests are exercises that are designed to assess whether a bank or a group of banks are adequately capitalized even under adverse economic scenarios (Goldstein, 2017). Such tests are being conducted by the international Monetary Fund (IMF) since the late 1990s, but have gained prominence following the global financial crisis. For example, the Supervisory Capital Assessment Program (SCAP) undertaken by the US Federal Reserve in 2009 and its subsequent evolution into Comprehensive Capital Analysis and Review (CCAR) have effectively dovetailed the result of such stress tests in the capital planning process of individual banks. Essentially, stress tests are meant to be “what if” exercises. Hence the construction of scenarios and underlying assumptions are important. The general guideline about construction of scenarios are that they should be “severe but plausible” and the construction of scenarios have varied based on the jurisdiction. For example, in the Bank of England’s new stress testing regime, an effort is being made to make the scenarios countercyclical: “The stress test will become more severe as the risks get bigger and less severe as those risks either materialize or shrink” (Brazier, 2015). In the Indian case, to ascertain the resilience of the banking sector to macroeconomic shocks, macro-stress test for credit risk under three hypothetical scenarios, viz. baseline, medium stress and severe stress, is conducted and reported in the Financial Stability Reports (FSRs) since June 2011. At present, the three scenarios are based on assumed adverse shocks, with increasing severity, to macroeconomic variables such as gross value added (GVA) growth, gross fiscal deficit to GDP ratio, CPI Inflation, weighted average lending rate, exports to GDP ratio and current account balance to GDP ratio. 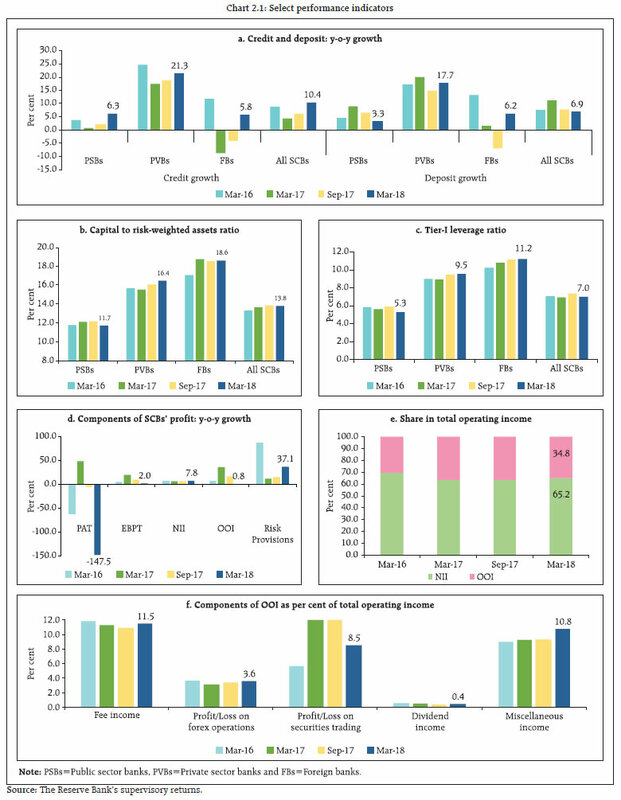 The stress impact assessment for Indian banks marries top-down system-level impact of adverse macro scenarios on banking sector's gross non-performing assets (GNPA) under three complementary econometric models viz., multivariate regression, vector auto regression (VAR) and quantile regression (details in Annex 2). 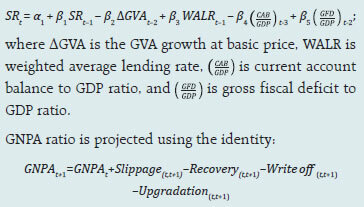 The average of projections for GNPAs derived from these three models is presented at the bank group levels. Currently, top-down assessment of macroeconomic shocks on the capital adequacy of an individual bank entails first, the projection of risk weighted assets (RWA) and second, the projection of profit after tax (PAT). Projection of RWA involves projection of bank-wise RWA through the Internal Rating Based formula (IRB) for credit risk after obtaining projections of disaggregated sectoral probability of defaults. RWA (other than credit risk) is projected based on average growth rate in the past. The PAT at the bank level is projected through forward-looking estimates of net interest income, other operating income, other expenses and provisions. In addition to the top-down macro-stress test for credit risk, a number of single-factor sensitivity tests are carried out to look at bank-specific or idiosyncratic vulnerability. The method outlined above produces ‘first order impact’ of a macro-economic shock and doesn’t include ‘feedback’ or ‘second order’ effects (Haldane, 2009). Such feedback is captured in this Report in a limited way by looking at the solvency losses due to contagion after taking into account the impact of macroeconomic shocks. On balance, it is critical to appreciate that outcomes under the assumed stress scenarios, while being plausible, are neither forecasts nor are expected outcomes. Stress tests and consequent disclosure of results strive to remove information asymmetry that can cripple markets when adverse scenarios materialise. In other words, stress tests are potentially an important tool to communicate with economic agents to reinforce financial stability and build resilience in bank balance-sheets against economic adversity. 1. Brazier, Alex (2015), ‘The Bank of England’s Approach to Stress Testing the UK Banking System’, Presentation at the LSE Systemic Risk Centre Conference on Stress Testing and Macroprudential regulation, London School of Economics, October 29-30. 2. Goldstein, Morris (2017), ‘Banking’s Final Exam- Stress Testing and Bank Capital Reform’, Peterson Institute of International Economics. 3. Haldane, Andrew (2009), ‘Rethinking Financial Network’, Speech at Financial Student Association, Amsterdam, April, 28. 2.10 The stress tests indicate that under the baseline scenario, the GNPA ratio of all SCBs may increase from 11.6 per cent in March 2018 to 12.2 per cent by March 2019. However, if the macroeconomic conditions deteriorate, their GNPA ratio may increase further under such consequential stress scenarios (Chart 2.9). Among the bank groups, PSBs’ GNPA ratio may increase from 15.6 per cent in March 2018 to 17.3 per cent by March 2019 under severe stress scenario, whereas PvBs’ GNPA ratio may rise from 4.0 per cent to 5.3 per cent and FBs’ GNPA ratio might increase from 3.8 per cent to 4.8 per cent. 2.11 Under the assumed baseline macro scenario, six PSBs under prompt corrective action framework (PCA PSBs) may have CRAR below the minimum regulatory level of 9 per cent by March 2019 without taking into account any further planned recapitalisation by the Government17. However, if macroeconomic conditions deteriorate, ten banks may record CRAR below 9 per cent under severe macro-stress scenario. 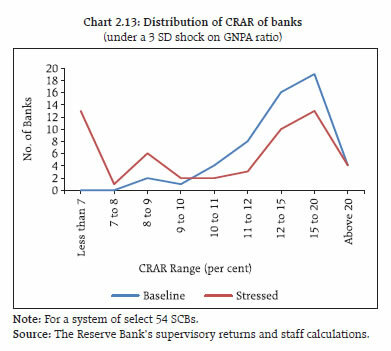 Under such a severe stress scenario, the system level CRAR may decline from 13.5 per cent to 11.5 per cent by March 2019, while under the baseline scenario, CRAR of SCBs may decline to 12.8 per cent (Chart 2.10). Under such severe stress scenario, six banks may have common equity Tier 1 (CET 1) capital to risk-weighted assets ratio below minimum regulatory required level of 5.5 per cent by March 2019. The system level CET 1 capital ratio may decline from 10.4 per cent in March 2018 to 8.6 per cent by March 2019 under severe stress scenario (Chart 2.11). The capital augmentation plan announced by the Government will go a long way in addressing potential capital shortfall as also play a catalytic role in credit growth. 2.12 A comparative analysis of PCA PSBs vis-à-vis non-PCA PSBs is given in the Box 2.2. The global financial crisis demonstrated the shortcomings of the framework for effective financial crisis management and in many cases the absence of effective resolution mechanism to handle systemic financial institutions. A resolution mechanism is put in place when a financial institution has weakened substantially, but a framework of preventive as well as early intervention measures could potentially arrest the deterioration in financial institutions in the first place. Putting in place a prompt corrective action (PCA) framework that incorporates graded triggers at pre-specified levels for taking early actions by the regulators is important for the financial sectors (Report of the Working Group on Resolution Regime for Financial Institutions, RBI, 2014). In literature, the efficacy of a PCA has been studied extensively, particularly, in the United States. The consensus is that it has worked well, particularly, in terms of raising capital ratios and reducing risks for banks (for example, Benston and Kaufmann 1997; Aggarwal and Jaques 2001; Elizalde and Repullo 2004). Freixas and Parigi (2007) provide theoretical support for PCA framework by showing that optimal capital regulation consists of a rule that i) allows well-capitalised banks to freely invest any amount in any risky assets, ii) prohibits banks with intermediate levels of capital to invest in the most opaque risky assets, and iii) prohibits undercapitalized banks to invest in risky assets at all. Freixas and Parigi (2007) argue that the rationale behind the mandate to PCA is preventing regulatory forbearance of undercapitalised banks. In the absence of such a mandate, banks have lower incentives to take costly actions to bolster their capital ratios. The Reserve Bank of India initiated a Scheme of Prompt Corrective Action (PCA) in 2002 in respect of banks which hit certain regulatory trigger points in terms of capital to risk weighted assets ratio (CRAR), net non-performing assets (NNPA), and return on assets (RoA). The scheme was revised in April 2017. Under the Revised PCA framework, apart from the capital, asset quality and profitability, leverage is being monitored additionally. Under PCA, banks face restrictions on distributing dividends, remitting profits and even on accepting certain kinds of deposits. Besides, there are restrictions on the expansion of branch network, and the lenders need to maintain higher provisions, along with caps on management compensation and directors’ fees. In other words, the entire thrust of the current PCA framwork is to prevent further capital erosion and more importantly, to strengthen them to the point of resilience so that they can, as soon as posible restart their normal operations. Eleven PSBs are currently under the PCA framework. Impairment in the asset quality of these banks remains high, necessitating sizeable provisioning and deleveraging, thereby constraining not only their capacity to lend but also the desirability of their lending and acceptance of public deposits. Profitability and capital position of these banks have seen erosion. 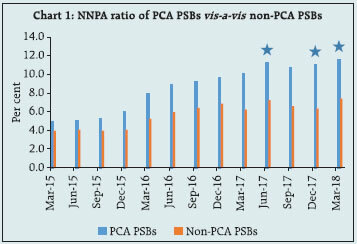 An analysis of the NNPA ratios of PCA PSBs vis-à-vis non-PCA PSBs18 revealed that the NNPA ratio of PSBs under PCA was around 12 per cent in March 201819 (Chart 1). 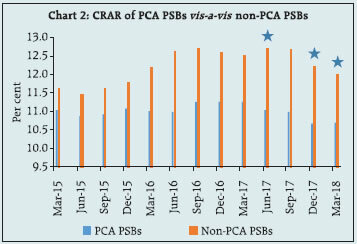 The gap between the CRAR of PCA PSBs and non-PCA PSBs has widened over the years (Chart 2). Although non-PCA PSBs are also loss-making currently, the extent of losses made by PCA PSBs has increased further over the years (Chart 3). 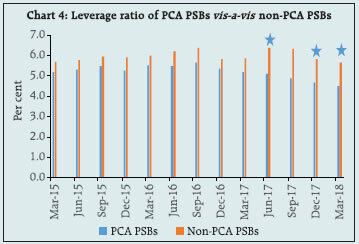 Leverage ratio of PCA PSBs has been deteriorating steadily since September 2016 (Chart 4). ★ Quarters in which specific PSBs were put under PCA. i.e., 5 banks in quarter ending June 2017, 5 banks in quarter ending December 2017 and one bank in quater ending March 2018. 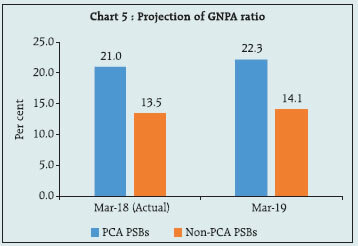 The estimation using the data for the period from June 2002 to March 2018 suggests that the GNPA ratio for PCA PSBs might go up from 21.0 per cent in March 2018 to 22.3 per cent by March 2019, whereas the GNPA ratio of non-PCA PSBs could increase relatively moderately from 13.5 per cent in March 2018 to 14.1 per cent in March 2019 (Chart 5). In the absence of further capital infusion (i.e. 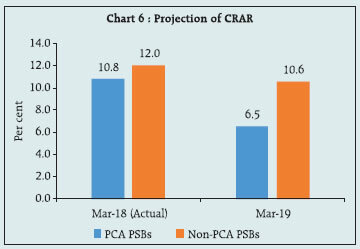 over and above done till March 31, 2018), CRAR of PCA PSBs may come down from 10.8 per cent in March 2018 to 6.5 per cent by March 2019 under the baseline scenario whereas for the non-PCA PSBs, the CRAR may decline from 12.0 per cent in March 2018 to 10.6 per cent by March 2019 (Chart 6). 1. Aggarwal, R. and K. T. Jaques (2001), 'The Impact of FDICIA and prompt corrective action on bank capital and risk: Estimates using a simultaneous equations model', Journal of Banking and Finance 25, 1139-1160. 2. Benston, J. G. and G. J. Kaufman (1997). 'FDICIA after Five Years', Journal of Economic Perspectives 11, 139-158. 3. Elizalde, A., and R. Repullo, (2004). 'Economic and regulatory capital. What is the difference? ', CEPR Discussion Papers. 4. Freixas, X. and B. M. Parigi (2007). 'Banking regulation and prompt corrective action', Working Paper No. 2136, CESifo. 5. Reserve Bank of India (2014), Report of the Working Group on Resolution Regime for Financial Institutions, May. 2.13 A number of single-factor sensitivity stress tests23, based on March 2018 data, were carried out on SCBs to assess their vulnerabilities and resilience under various scenarios. Their resilience with respect to credit, interest rate, equity prices, and liquidity risks was studied through a top-down24 sensitivity analysis. The same set of shocks was used on select SCBs to conduct bottom-up stress tests. 2.14 Under a severe shock of 3 SD25 (that is, if the GNPA ratio of 54 select SCBs moves up from 11.5 per cent to 17.5 per cent), the system-level CRAR will decline from 13.5 per cent to 10.4 per cent and Tier- 1 CRAR will decline from 11.4 per cent to 8.1 per cent (Chart 2.12a). The impairment in capital at the system level could thus be about 25 per cent. The results of reverse stress test show that it requires a shock of 4.28 SD to bring down the system-level CRAR to 9 per cent. 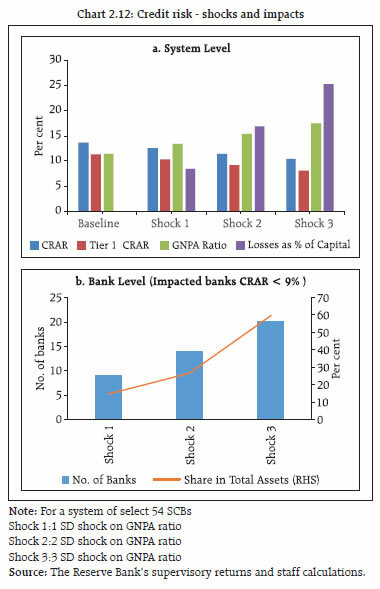 Bank-level stress test results show that 20 banks having a share of 59.7 per cent of SCBs’ total assets might fail to maintain the required CRAR under a shock of a 3 SD increase in GNPA ratio (Chart 2.12b). PSBs were found to be severely impacted with the CRAR of 18 of the 21 PSBs likely to go down below 9 per cent in case of such a shock. 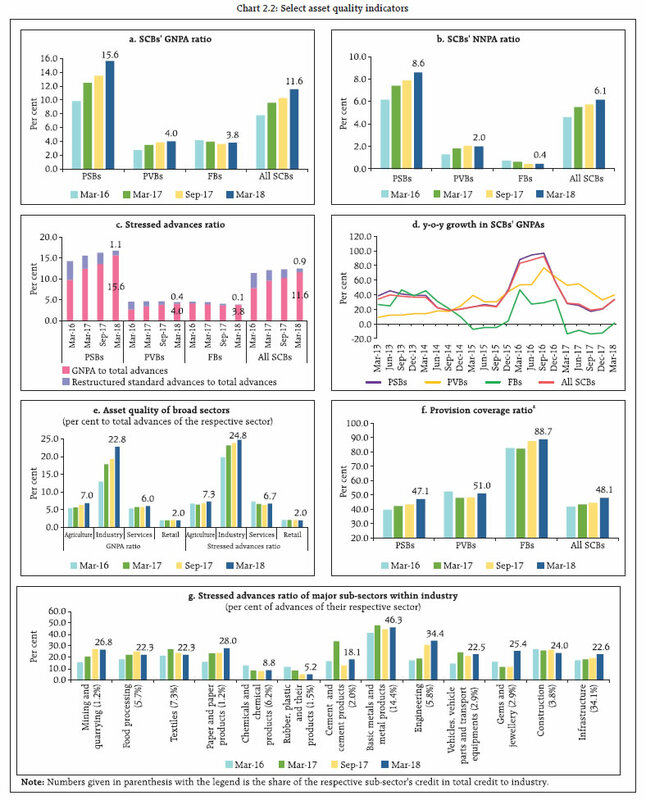 2.15 Distribution of CRAR of select SCBs shows that under a 3 SD shock on the GNPA ratio, PvBs and FBs experienced a less than 4 per cent shift in CRAR while PSBs dominate the right half of the distribution (Chart 2.13). Among PSBs, PCA PSBs experienced larger shifts in CRAR under the shock as compared to non-PCA PSBs, pointing towards the stress underlying in their books making them more vulnerable to shocks (Chart 2.14). 2.16 Stress tests on banks’ credit concentration, considering top individual borrowers according to their stressed advances, showed that in the extreme scenario of the top three individual borrowers failing to repay26, the impact was significant for eight banks. These banks account for 17.4 per cent of the total assets of SCBs. The impact on CRAR at the system level under the assumed scenarios of failure of the top 1, 2 and 3 stressed borrowers will be 63, 99 and 124 basis points respectively (Chart 2.15). 2.17 Stress tests on banks’ credit concentration, considering top individual borrowers according to their exposures, showed that in the extreme scenario of top three individual borrowers failing to repay27, the impact was significant for five banks. These 5 banks account for 9.8 per cent of the total assets of SCBs (Chart 2.16). The impact on CRAR at the system level under the assumed scenario of default by all the top 3 individual borrowers will be 99 basis points. 2.18 Stress tests using different scenarios, based on the information of top group borrowers in the banks’ credit exposure concentration, reveal that the losses could be around 7.0 per cent and 11.8 per cent of the capital at the system level under the assumed scenarios of default by the top group borrower and by the top two group borrowers respectively28. As many as seven banks will not be able to maintain their CRAR level at 9 per cent if top 3 group borrowers default (Table 2.1). * For a system of select 51 SCBs. 2.19 Credit risk arising from exposure to the infrastructure sector (specifically power, transport and telecommunication) as well as textiles and engineering was examined through a sectoral credit stress test where the GNPA ratio of the specific sector was assumed to increase by a fixed percentage point. The resulting impact on the GNPA ratio of the entire banking system was examined. PSBs had the maximum exposure to these sectors and also account for the highest GNPAs, particularly in the power and the telecom sector. The results of the stress tests show that among the considered sectors, the most severe shock to the power sector will cause the banking system GNPAs to rise by about 68 bps. The textile and the engineering sectors, though small in terms of total advances to that sector as compared to the infrastructure sector, also exhibited considerable transmission of stress to the banking sector (Chart 2.17). 2.20 For investments under available for sale (AFS) and held for trading (HFT) categories (direct impact), a parallel upward shift of 2.5 percentage points in the yield curve will lower the CRAR by about 126 basis points at the system level (Table 2.2). At the disaggregated level, six banks accounting for 9.9 per cent of the total assets could be impacted adversely with their CRAR falling below 9 per cent. The total loss of capital at the system level is estimated to be about 10.4 per cent. The assumed shock of a 2.5 percentage points parallel upward shift of the yield curve on the held to maturity (HTM) portfolios of banks, if marked-to-market (MTM), will reduce the CRAR by about 260 basis points (bps) resulting in 16 banks’ CRAR falling below 9 per cent. Note: For a system of 48 select SCBs. Source: The Reserve Bank’s supervisory returns and staff calculations. 2.21 Yields on 10-year benchmark sovereign debt moved from 7.3 per cent on January 01, 2018 to 7.8 per cent on May 14, 2018. This translates into an approximately 25 bps decline in system-wide CRAR (given their asset positions and durations as at end- March 2018). CRAR of 2 banks may fall below the minimum regulatory requirement of 9 per cent (assuming that they do not spread out their losses across the four quarters). The PV01 values were at ₹ 3.7 billion for PSBs, ₹ 0.6 billion for PvBs and ₹ 0.3 billion for FBs as on end-March 2018. A further upward pressure on the yields may constrain an already stressed profitability of the banking sector. 2.22 Under the equity price risk, the impact of a shock of a fall in equity prices on bank capital and profit was examined. 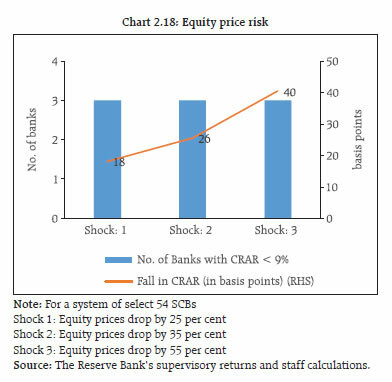 The system-wide CRAR would decline by 40 basis points from the baseline under the stressful 55 per cent drop in equity prices, while the CRAR of three banks will fall below the regulatory requirement of 9 per cent (Chart 2.18). The impact of a drop in equity price is limited for the overall system because of very low regulatory limits prescribed on banks’ exposures to capital markets. 2.23 The liquidity risk analysis aims to capture the impact of deposit run-offs and increased demand for the unutilised portions of credit lines which were sanctioned/committed/guaranteed. Banks in general may be in a position to withstand liquidity shocks with their high quality liquid assets (HQLAs)29. In assumed scenarios, there will be increased withdrawals of un-insured deposits30 and simultaneously there will also be increased demand for credit resulting in withdrawal of the unutilised portions of sanctioned working capital limits as well as utilisation of credit commitments and guarantees extended by banks to their customers. 2.24 Using their HQLAs required for meeting day-to-day liquidity requirements, 42 banks will remain resilient in a scenario of assumed sudden and unexpected withdrawals of around 12 per cent of their deposits along with the utilisation of 75 per cent of their committed credit lines (Chart 2.19). 2.25 A series of bottom-up stress tests (sensitivity analyses) were conducted for the select sample of banks,31 with the reference date as 31 March, 2018. The results of the bottom-up stress tests carried out by select banks also testified to the banks’ general resilience to different kinds of shocks. 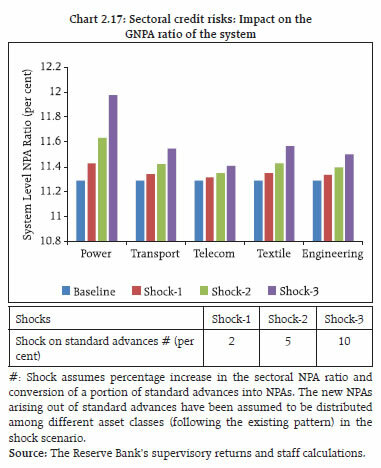 The bottom-up stress tests show, however, that the impact was more severe for some banks in particular 5 PSBs, especially in case of shocks imparted on NPAs, with their stressed CRAR positions falling below the regulatory minimum of 9 per cent (Chart 2.20). 2.26 The results of bottom-up stress tests for liquidity risk show a significant impact of liquidity shocks on select banks. 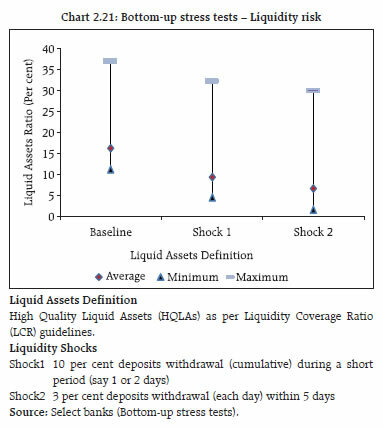 Liquid assets ratios32 reflect the liquidity position of select banks under different scenarios. 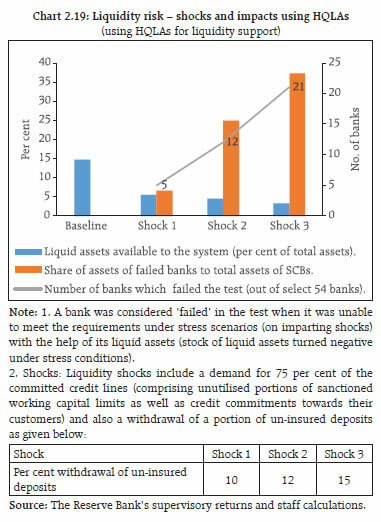 The results show that HQLAs enable the banks in the sample to sustain themselves against the liquidity pressure from sudden and unexpected withdrawal of deposits by depositors (Chart 2.21). The banks have higher liquid asset ratios when compared to the exercise last year. 2.27 A series of bottom-up stress tests (sensitivity analyses) on derivative portfolios were conducted for select banks33 with the reference date as on March 31, 2018. The banks in the sample reported the results of four separate shocks on interest and foreign exchange rates. The shocks on interest rates ranged from 100 to 250 basis points, while 20 per cent appreciation/depreciation shocks were assumed for foreign exchange rates. The stress tests were carried out by applying individual shocks. 2.28 In the sample, the marked to market (MTM) value of the derivatives portfolio for the banks varied with PSBs and PvBs registering small MTM values, while FBs had a relatively large positive as well as negative MTM values. 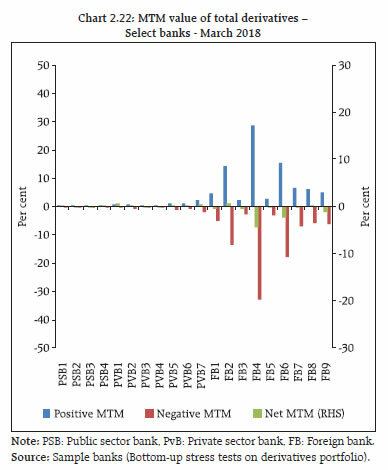 Most of the PSBs and PvBs had positive net MTM, while many FBs recorded negative net MTM values (Chart 2.22). 2.30 At the system level,34 the CRAR of scheduled urban co-operative banks (SUCBs) remained unchanged at 13.6 per cent between September 2017 and March 2018. However, at a disaggregated level, CRAR of four banks35 was below the minimum required level of 9 per cent. GNPAs of SUCBs as a percentage of gross advances declined from 8.5 per cent to 6.0 per cent and their provision coverage ratio36 increased from 47.1 per cent to 61.8 per cent during the same period. Further, the RoAs of SUCBs declined from 0.9 per cent to 0.6 per cent and the liquidity ratio37 declined from 35.7 per cent to 34.9 per cent during the same period. 2.31 The impact of credit risk shocks on the SUCBs’ CRAR was observed under four different scenarios38. The results show that even under a severe shock of increase in GNPAs by 2 SD, the system-level CRAR of SUCBs remained above the minimum regulatory requirement. At the individual level, however, a number of SUCBs (26 out of 54) may not be able to maintain the minimum CRAR. 2.32 A stress test on liquidity risk was carried out using two different scenarios; i) 50 per cent, and ii) 100 per cent increase in cash outflows, in the 1 to 28 days’ time bucket. It was further assumed that there was no change in cash inflows under both the scenarios. The stress test results indicate that 25 banks under the first scenario and 40 banks under the second scenario are impacted significantly39. 2.33 As of March 2018, there were 11,402 non-banking financial companies (NBFCs) registered with the Reserve Bank, of which 156 were deposit-accepting (NBFCs-D). There were 249 systemically important non-deposit accepting NBFCs (NBFCs- ND-SI)40. All NBFC-D and NBFCs-ND-SI are subjected to prudential regulations such as capital adequacy requirements and provisioning norms along with reporting requirements. 2.34 The aggregate balance sheet size of the NBFC sector41 as on March 2018 was ₹22.1 trillion. There was deceleration in share capital growth of NBFCs in 2017-18 whereas borrowings grew at 19.1 per cent, implying rising leverage in the NBFC sector. Loans and advances of the NBFC sector increased by 21.2 per cent and investments increased by 13.4 per cent (Table 2.3). Source: The Reserve Bank’s supervisory returns. 2.35 Net profit increased by 30.8 per cent in 2017-18. RoA was 1.9 per cent in 2017-18 as compared with 1.6 per cent in 2016-17 (Table 2.3 and 2.4). 2.36 GNPAs of the NBFC sector as a percentage of total advances decreased from 6.1 percent in 2016-17 to 5.8 percent in 2017-1842. 2.37 As per extant guidelines, NBFCs are required to maintain a minimum capital level consisting of Tier-I43 and Tier-II capital, of not less than 15 per cent of their aggregate risk-weighted assets. NBFCs’ CRAR increased from 22.0 per cent in 2016-17 to 22.9 per cent in 2017-18 (Table 2.5). 2.38 Stress test on credit risk for the NBFC sector as a whole for the year ended March 2018 was carried out under three scenarios: Increase in GNPA by (i) 0.5 standard deviation (SD), (ii) 1 SD and (iii) 3 SD. The results indicate that in the first scenario, the sector’s CRAR declines from 22.9 per cent to 21.6 per cent. In the second scenario, it declines to 21.3 per cent and in the third scenario it declines to 20.4 per cent. 2.39 The stress test results for individual NBFCs indicate that under first two scenarios, around 8 per cent of the companies will not be able to comply with the minimum regulatory capital requirements of 15 per cent. Around 10 per cent of the companies will not be able to comply with the minimum regulatory CRAR norm under the third scenario. 2.40 The size of the inter-bank market shrank from ₹8.1 trillion in March 2017 to ₹6.5 trillion in March 2018. 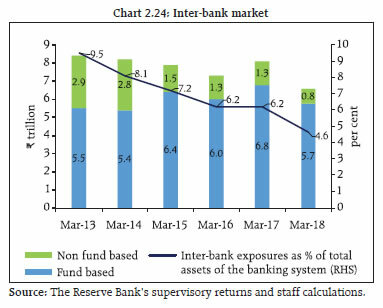 Inter-bank exposures constituted 4.6 per cent of the total assets of the banking system in March 2018, indicating substantial decline from 9.5 per cent five years ago. The fund-based segment which dominated the inter-bank market had a share of nearly 88 per cent in March 2018 as against 84 per cent in March 2017 (Chart 2.24). 2.41 PSBs continued to be the dominant players in the inter-bank market with a share of 58 per cent (as compared to a share of 65 per cent in total bank assets) followed by PvBs at 30.1 per cent (share of 29 per cent in total bank assets) and FBs at 11.9 per cent (share of only 6 per cent in total bank assets) as on March 2018 (Chart 2.25). 2.42 Composition of short-term (ST) fund based inter-bank exposure shows that the highest share was of ST deposits followed by ST loans. Similarly, the composition of long-term (LT) fund based inter-bank exposure shows that LT loans had the highest share followed by LT debt instruments (Chart 2.26). 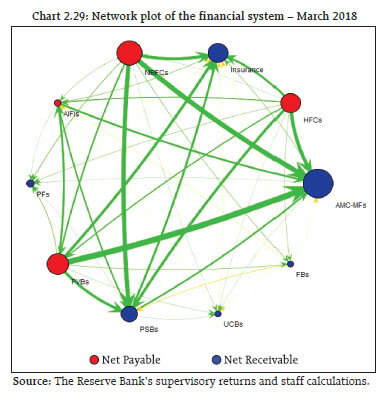 2.43 The network structure46 of the banking system47 showed that the number of dominant banks (that is banks in the inner most core) declined from nine to four during March 2012 and March 2018 (Chart 2.27). 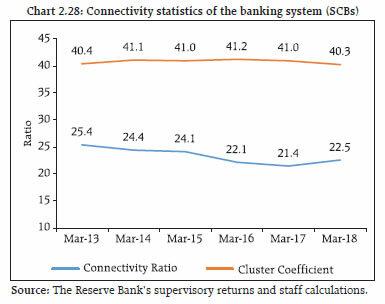 2.44 The degree of interconnectedness in the banking system (SCBs), as measured by the connectivity ratio48, increased marginally between March 2017 and March 2018. The cluster coefficient49, which depicts local interconnectedness, has remained almost constant between March 2013 and March 2018 indicating that clustering/grouping within the banking network did not change much over time (Chart 2.28). 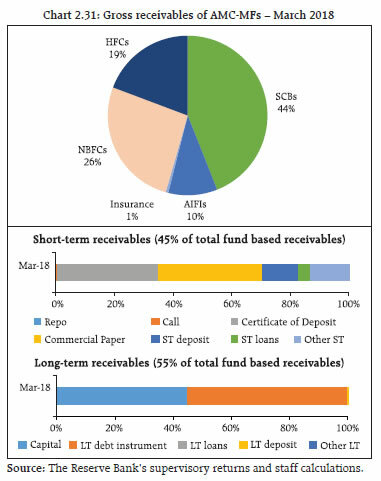 2.45 From the perspective of the financial system51, SCBs continued to be the dominant players accounting for nearly 46 per cent of the bilateral exposure in March 2018 (51 per cent in March 2017), followed by asset management companies managing mutual funds (AMC-MFs) at 15 per cent (13 per cent in March 2017), non-banking financial companies (NBFCs) at 12 per cent, housing finance companies (HFCs) at 9 percent and insurance companies and all-India financial institutions (AIFIs) at 8 percent each. Pension funds (PFs) accounted for 1 per cent of the bilateral exposure in the financial system and SUCBs for less than 0.5 per cent. 2.46 In terms of inter-sectoral52 exposure, AMC-MFs were the dominant fund providers in the system, followed by the insurance companies, while NBFCs followed by HFCs and SCBs were the dominant receivers of funds. 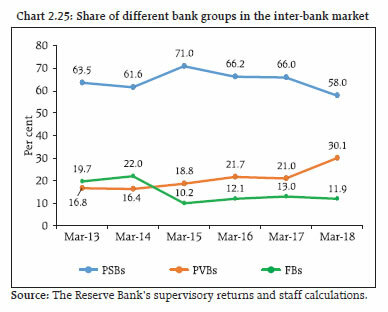 However, within SCBs, PvBs had a net payable position vis-à-vis the entire financial sector, whereas PSBs and FBs had a net receivable position (Chart 2.29 and Table 2.6). 2.47 All lenders (that is, those who have a net receivable position against the rest of the financial system) except SUCBs recorded an increase in their net receivable position in March 2018 over March 2017. The increase in the PSBs’ net receivable position indicates their slower credit growth and the consequent channelisation of some of their deposits to other entities in the financial system. Among the borrowers, funds borrowed by NBFCs, PvBs, and HFCs increased between March 2017 and March 2018. In contrast, funds borrowed by AIFIs and FBs decreased; in the case of FBs they decreased to such an extent that they became net lenders to the financial system (Chart 2.30). 2.48 The banking sector had an exposure (gross receivable) of nearly ₹323 billion in March 2018 towards the insurance and mutual fund sectors taken together (as against ₹154 billion in March 2017). However, the combined exposure (gross receivable) of AMC-MFs and insurance companies towards the banking sector was much larger (nearly ₹6.2 trillion in March 2018 as against ₹4.8 trillion in March 2017). 2.49 AMC-MFs were the largest net providers of funds to the financial system. Their gross receivables were around ₹8,852 billion (around 41 per cent of their average AUM), and their gross payables were around ₹560 billion in March 2018. Almost all their receivables (99.7 per cent) were fund based in nature. Top three recipients of their funds were SCBs (at 44 per cent) followed by NBFCs (at 26 per cent) and HFCs (at 19 per cent). 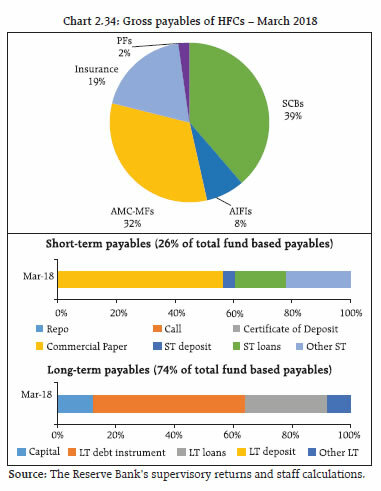 AMC-MFs were quite active in the money markets (particularly CP and CD markets) with about 45 per cent of their receivables being short-term in nature. The remaining 55 per cent of their receivables were long-term in nature, in which LT debt followed by Capital had the largest shares (Chart 2.31). 2.50 Insurance companies had gross receivables of ₹5,022 billion and gross payables of around ₹207 billion making them the second largest net providers of funds to the financial system in March 2018. Like AMC-MFs, a breakup of their gross receivables indicates that the top 3 recipients of their funds were SCBs (at 46 per cent), followed by NBFCs (at 28 per cent), and HFCs (at 20 per cent). But in contrast to AMC-MFs, insurance companies had limited exposure to short-term instruments. Around 91 per cent of their receivables were long-term in nature, in which LT debt followed by Capital were the most important (Chart 2.32). 2.51 NBFCs were the largest net borrowers of funds from the financial system with gross payables of around ₹7,170 billion and gross receivables of around ₹419 billion in March 2018. A breakup of gross payables indicates that the highest funds were received from SCBs (44 per cent of total funds received by NBFCs), followed by AMC-MFs (at 33 per cent) and insurance companies (at 19 per cent). LT debt followed by LT loans and CPs were the three biggest sources of funds for NBFCs (Chart 2.33). 2.52 HFCs were the second largest borrowers of funds from the financial system with gross payables of around ₹5,284 billion and gross receivables of only ₹312 billion in March 2018. As on March 2018, HFCs’ borrowing pattern was quite similar to that of NBFCs except that AIFIs also played a significant role in providing funds to HFCs. Like NBFCs, LT debt, LT loans, and CPs were the top three instruments through which HFCs raised funds from the financial markets (Chart 2.34). 2.53 A contagion analysis using network tools was done to estimate the systemic importance of different banks. Failure of a bank which is systemically more important will lead to greater solvency and liquidity losses in the financial system. Solvency and liquidity losses, in turn, depend on the initial capital and liquidity position of the banks along with the number, nature (whether it is a lender or a borrower) and magnitude of the interconnections that the failing bank has with the rest of the banking system. 2.54 In this analysis, banks were hypothetically triggered one at a time and their impact on the banking system is seen in terms of the number of subsequent bank failures that took place and the amount of solvency and liquidity losses that were incurred (Chart 2.35). The assessment of impact of joint solvency54 - liquidity55 contagion was carried out for SCBs and SUCBs together56. 2.55 A contagion analysis of the banking network57 indicates that if the bank with the maximum capacity to cause contagion losses fails (labelled as Bank 1 in Table 2.7), it will cause a solvency loss to the system of about 9.0 per cent of total Tier 1 capital, liquidity loss of 4.2 per cent of total liquid assets, and failure of 15 banks. Note: Top five ‘Trigger banks’ have been selected on the basis of the number of defaults further triggered by them. 2.56 On expected lines, analysis also revealed that the failure of a SCB will not only cause further distress to other SCBs but also to SUCBs, whereas, the impact of the failure of a SUCB will be confined to SUCBs only. 2.57 The contagion impact of the failure of a bank is likely to be magnified if macroeconomic shocks result in distress in the banking system in a situation of a generalised downturn in the economy. In this analysis, macroeconomic shocks are given to the SCBs, which cause some of the SCBs to fail the solvency criterion, which then act as a trigger causing further solvency losses. The initial impact of macroeconomic shocks on individual banks’ capital was taken from the macro-stress tests, where a baseline and two (medium and severe) adverse scenarios were considered for March 2019 (Chart 2.8)58. 2.58 The contagion impact on the outcome of the macro stress test shows that additional solvency losses due to contagion (on top of initial loss of capital due to the macro shocks) to the banking system in terms of Tier 1 capital is limited to 2.7 per cent for the baseline, 4.1 per cent for medium stress and 8.4 per cent for the severe stress scenarios. 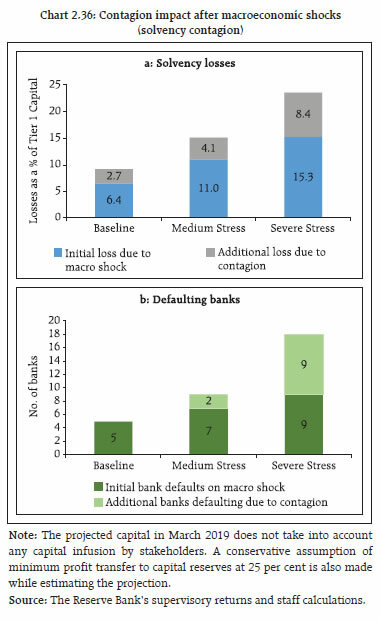 Also, the additional number of defaulting banks due to contagion (on top of initial defaulting banks due to the macro shocks) are zero for baseline, two for medium stress and nine for severe stress scenarios (Chart 2.36). 1 The analyses done in the chapter are based on latest available data as of June 14, 2018, which is provisional. 2 Analyses are based on the Reserve Banks’ supervisory returns which cover only domestic operations of SCBs, except in the case of data on large borrowers, which is based on banks’ global operations. SCBs include public sector banks, private sector banks and foreign banks. 4 Cost of interest bearing liabilities was calculated as the ratio of interest expenses to average interest bearing liabilities. 5 Return on interest earning assets was calculated as the ratio of interest income to average interest earning assets. 6 Spread was calculated as the difference between the return on interest earning assets and the cost of interest bearing liabilities. 7 For the purpose of analysing asset quality, stressed advances are defined as GNPAs plus restructured standard advances. 8 Provision coverage ratio=provisions held for NPA*100/GNPAs. This does not include provisions on account of written-off assets. 9 A large borrower is defined as one who has aggregate fund-based and non-fund based exposure of ₹ 50 million and above. This analysis is based on SCBs’ global operations. SMA-2: Principal or interest payment or any other amount wholly or partly overdue between 61 - 90 days. 11 The detailed methodology and basic indicators used under different BSI dimensions are given in Annex-2. 12 A sample of 55 SCBs. 13 The detailed methodology is given in Annex 2. 14 In terms of GVA growth, gross fiscal deficit-to-GDP ratio, CPI (combined) inflation, weighted average lending rate, exports-to-GDP ratio and current account balance-to-GDP ratio. 15 Continuously increasing by 0.25 SD in each quarter for both the scenarios. 16 These stress scenarios are stringent and conservative assessments under hypothetical and severely adverse economic conditions. As such, the scenarios should not be interpreted as forecasts or expected outcomes. 17 It has, however, factored in Government’s capital infusion plan to the extent the capital has been actually infused till March 31, 2018. 18 10 PSBs which are not under PCA have been included as non-PCA PSBs. 19 As per the RBI’s revised PCA framework for banks, risk threshold for the NNPA ratio is 6 per cent. 20 PAT and RWA (Credit risk) and RWA (Others) were projected using the methodology of macro-tress test detailed in Annex 2. 21 Since bank provisions have embedded recovery assumptions as per IRAC norms, the projected provisions have recovery assumptions embedded therein. 22 The sensitivity analysis was undertaken in addition to macro stress tests for credit risk. While in the former, shocks were given directly to asset quality (GNPAs), in the latter the shocks were in terms of adverse macroeconomic conditions. While the focus of the macro stress tests is credit risk, the sensitivity analysis covers credit, interest rate, equity price and liquidity risks. 23 For details of the stress tests, see Annex 2. 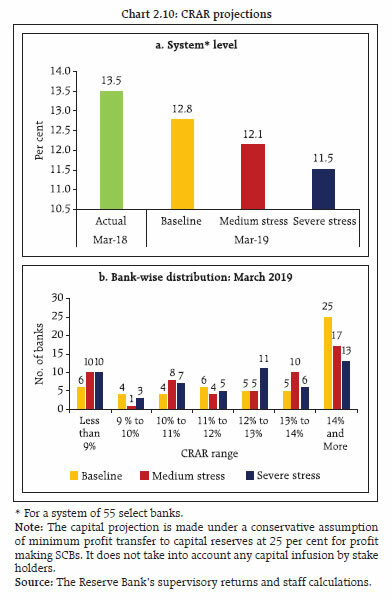 24 Top down stress tests have been conducted by RBI based on specific scenarios and on aggregate bank-wise data to give a comparative assessment of the impact of a given stress testing exercise across banks. Bottom-up stress tests, on the other hand, have been conducted by the banks themselves using their own data and are based on the assumptions or scenarios specified by RBI. 25 The SD of the GNPA ratio is estimated using quarterly data since 2003. 26 In case of failure, the borrower is considered to move into the loss category. Please see Annex 2 for details. 27 In case of default, the borrower is considered to move into the sub-standard category. Please see Annex 2 for details. 28 In case of default, the borrower is considered to move into the sub-standard category. Please see Annex 2 for details. 29 For this stress testing exercise, HQLAs were computed as cash reserves in excess of required CRR, excess SLR investments, SLR investments at 2 percent of NDTL (under MSF) and additional SLR investments at 9 per cent of NDTL based on end-March 2018 data. 30 Presently un-insured deposits are about 70 per cent of total deposits (Source: DICGC, Handbook of Statistics on the Indian Economy). 31 Stress tests on various shocks were conducted on a sample of 19 select banks (9 PSBs, 7 PvBs and 3 FBs). A same set of shocks was used for conducting top-down and bottom-up stress tests. Details are given in Annex 2. 33 Stress tests on derivatives portfolios were conducted for a sample of 20 banks. Details are given in Annex 2. 34 For a system of 54 SUCBs. 35 The share of four scheduled UCBs’ in the total assets of all the 54 scheduled UCBs is 1.5 per cent. 36 Provision coverage ratio=provisions held for NPA*100/GNPAs. 37 Liquidity ratio = (cash + dues from banks + SLR investment)*100/total assets. 38 The four scenarios are: i) 1 SD shock in GNPA (classified into sub-standard advances), ii) 2 SD shock in GNPA (classified into sub-standard advances), iii) 1 SD shock in GNPA (classified into loss advances), and iv) 2 SD shock in GNPA (classified into loss advances). SD was estimated using 10 years data. For details of the stress tests, please refer Annex 2. 39 As per RBI guidelines, mismatch [negative gap (cash inflow less cash outflow)] should not exceed 20 per cent of outflow in the time bucket of 1 to 28 days. The reason behind many SUCBs falling above 20 per cent mismatch after shock is that SUCBs are functioning under very thin margin of liquidity. 40 As per guidelines dated March 15, 2018, all Government NBFCs are required to submit online return to RBI. 42 The NPA recognition norms of NBFCs were aligned with those of banks on a glide path. As on 2017-18, it might be expected that such convergence of norms would result in GNPA ratio for the sector showing an increase. However, owing to up-gradation of significant portfolio of assets classified as NPA in 2016-17 as also due to asset growth, the ratio has marginally declined. 43 From April 1, 2017 onwards, NBFC-ND-SIs and all deposit taking NBFCs are required to maintain minimum Tier 1 capital of 10 percent. 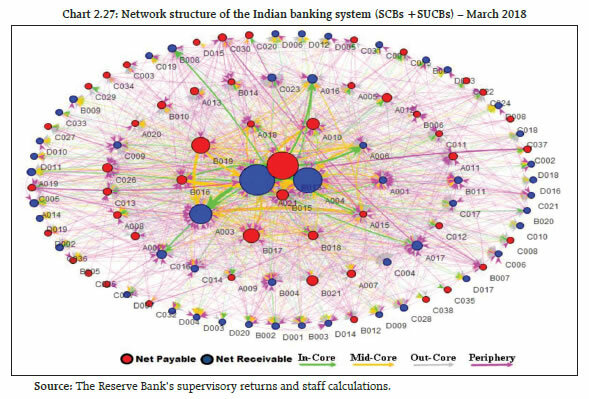 44 The network model used in the analysis has been developed by Professor Sheri Markose (University of Essex) and Dr. Simone Giansante (Bath University) in collaboration with the Financial Stability Unit, Reserve Bank of India. 45 The analysis is restricted to 80 scheduled commercial banks for data pertaining to end-March 2018. The inter-bank market exposure as connoted in the current analysis is a total of all outstanding exposures, short-term (up to 365 days) plus long-term (more than 365 days) between banks. 46 The diagrammatic representation of the network of the banking system is that of a tiered structure, where different banks have different degrees or levels of connectivity with others in the network. In the present analysis, the most connected banks are in the inner most core (at the centre of the network diagram). Banks are then placed in the mid core, outer core and the periphery (the respective concentric circles around the centre in the diagram), based on their level of relative connectivity. The colour coding of the links in the tiered network diagram represents the borrowing from different tiers in the network (for example, the green links represent borrowings from the banks in the inner core). Each ball represents a bank and they are weighted according to their net positions vis-à-vis all other banks in the system. The lines linking each bank are weighted on the basis of outstanding exposures. 47 80 SCBs and 20 SUCBs were considered for this analysis. 48 Connectivity ratio: This is a statistic that measures the extent of links between the nodes relative to all possible links in a complete network. 49 Cluster Coefficient: Clustering in networks measures how interconnected each node is. Specifically, there should be an increased probability that two of a node’s neighbours (banks’ counterparties in case of the financial network) are also neighbours themselves. A high cluster coefficient for the network corresponds with high local interconnectedness prevailing in the system. 50 Analysis presented here and in the subsequent part is based on a sample including 80 SCBs; 20 SUCBs; 22 AMC-MFs (which cover more than 90 per cent of the AUM of the mutual fund sector); 32 NBFCs (both deposit taking and non-deposit taking systemically important companies); 21 insurance companies (that cover more than 90 per cent of assets of the insurance companies); 15 HFCs; 7 PFs and 4 AIFIs (NABARD, EXIM, NHB and SIDBI). 51 Includes exposures between entities of the same group. 52 Inter-sectoral exposure does not include transactions among entities of the same group. 53 For methodology, please see Annex 2. 54 In solvency contagion analysis, gross loss to the banking system owing to a domino effect of one or more borrower banks failing is ascertained. Failure criterion for contagion analysis has been taken as Tier 1 CRAR falling below 7 per cent. 55 In liquidity contagion analysis, a bank is considered to fail when its liquid assets are not enough to tide over a liquidity stress caused by the failure of large net lender. Liquid assets are measured as: Excess SLR + excess CRR + 11 per cent NDTL. 56 Same definition and criterion for failure have been taken for SUCBs as applicable for SCBs while assuming implementation of uniform regulation across the various types of banks going forward. 57 One PSB and one SUCB fail the solvency criterion at the beginning before the initiation of contagion. These 2 banks have been excluded from the Contagion Analysis. a) The projected losses under a macro scenario (calculated as reduction in projected Tier 1 CRAR, in percentage terms, in March 2019 with respect to the actual value in March 2018) were applied to the March 2018 capital position assuming proportionally similar balance sheet structures for both March 2018 and March 2019.
b) Bilateral exposures between financial entities have been assumed to remain the same for March 2018 and March 2019.